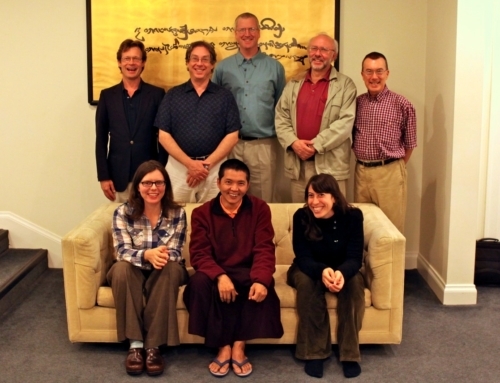 Sakyong Mipham Rinpoche, Sakyong Wangmo, Druk Sakyong Wangmo, Jigme Rinpoche and the Committee. Sakyong Mipham Rinpoche returned to Halifax during Surmang Khenpo’s visit with us, and we had an excellent meeting together (at which Khandro Tseyang served some delicious Tibetan delicacies, as an early Losar for Surmang Khenpo). We were able to continue our discussions on several texts included in the Daily Chant Book. We also reviewed with Surmang Khenpo a few texts composed by Jamgön Mipham Gyatso that will eventually be added to the Daily Chant Book: “Nyingma Lineage Supplications,” an aspiration for the Nyingma teachings to flourish, and “The Verses of the Eight Auspicious Noble Ones.” While editions of the first and last of those texts have been published, some research remains before they are complete. 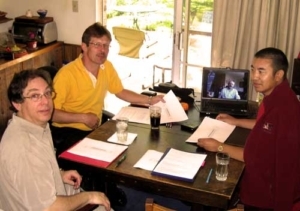 Gyetrul Jigme Rinpoche with the Translation Committee. The Sakyong has asked us to prepare a number of additional King Gesar of Ling liturgies that will eventually be incorporated into the vajrayana practice regimen of our community. Some of these are written by Jamgön Mipham Gyatso Rinpoche, who composed the Gesar protector chant and the long lhasang we’ve done for many years, and some are termas discovered by Namkha Drimed Rinpoche. This will be a multiyear project, and we have begun to produce draft translations. We’ve already completed some of this work with the help of Gyetrul Jigme Rinpoche when he came to teach in Halifax this summer. We had several very productive meetings with him on a Gesar guru yoga and two Gesar offering chants. In March, Changling Rinpoche came to North America and began his teaching tour at DDL and in Halifax. We met with him on the “Confession Liturgy” and several other texts, including the Gesar guru yoga mentioned above. Click here to get a look inside one of our meetings. 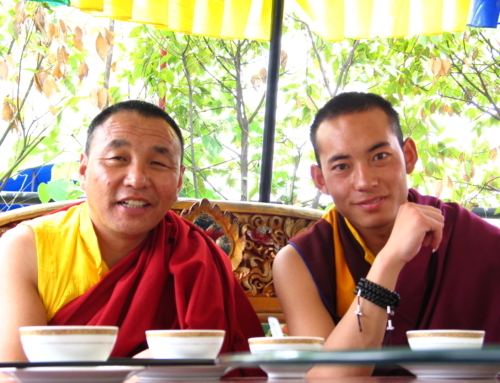 Last winter, we enjoyed almost a month with Surmang Khenpo from Surmang, now one of our main advisers. We reviewed many short texts, mostly by the Vidyadhara, including supplementary texts used in the Avalokiteshvara feast practice compiled and transmitted by Karma Senge Rinpoche last year. We are still compiling a commentary on these liturgies and finalizing our translations. In working with Karma Senge Rinpoche last year, we learned how some of these supplementary liturgies could be used as a ngöndro practice for the Vidyadhara’s terma teachings, and we hope to make that available to the sangha in the coming year. We continued our review of texts needed for the Krodhikali (Tröma Nagmo) Sadhana of black Vajrayogini and the Profound Heart Essence cycle of terma, both from among the Vidyadhara’s writings from Tibet. We don’t have any news of the hoped-for return of Karma Senge Rinpoche to the West, but we are working toward making this possible. Surmang Khenpo returned to Boulder this summer, and he plans to remain there until next year so he can complete his residency requirements for U.S. citizenship. Namkha Drimed Rinpoche and Sakyong Mipham Rinpoche look at the Sakyong’s new longevity chant. This summer, we met briefly with Namkha Drimed Rinpoche, during the Sakyong Wangmo events, in order to clarify a few lingering questions on the “Supplication for the Longevity of Sakyong Mipham Rinpoche” (click here for the PDF of the final version) he wrote, and this has now been reissued with a few minor revisions. The Sakyong paid a surprise visit midway in our meeting, and it was very helpful to have his viewpoint on the phrasing. A few months earlier he asked us to translate a general longevity supplication, meant to be used for a variety of teachers, without performing specific liturgies for each, as the number of lineage masters with whom we study grows. 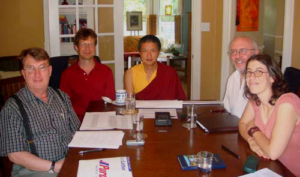 During the Conference of Translators in Boulder, Surmang Khenpo, Larry, and Mark meet on Gesar text with Committee in Halifax using on-line video conferencing. We produced several new publications over the last year. 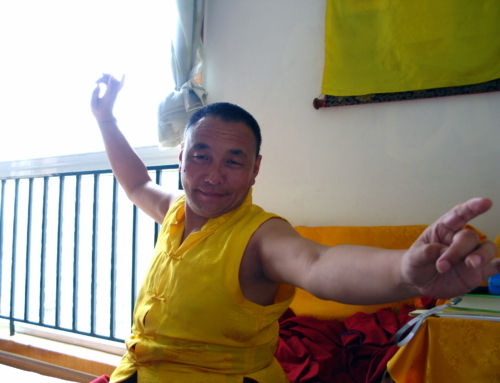 An edited transcript of talks by Changling Rinpoche from his seminar for sadhakas at Dorje Denma Ling on Khenpo Gangshar’s “Naturally Liberating Whatever You Meet” was just published this fall, and we look forward to Rinpoche’s return to continue this teaching. We are especially pleased to be able to offer committee-member Ann Helm’s fine translation of Miracle Stories of Mipham Rinpoche, composed by Khenchen Jigme Phuntsok. We released new editions of the Profound Guru Yoga, which now includes a long devotional poem that is to be inserted into the liturgy, along with a full commentary on this; and the Gesar offering (“Ocean of the Play of Enlightened Activity”), which includes an extensive commentary and practice instructions—both texts written in Tibet by the Vidyadhara; a new edition of The Life of Tilopa by the great Drukpa Kagyu master Pema Karpo, and very slightly revised editions of our Vajrayogini Sadhana Practice Manual, printed for the recent abhisheka this summer, and the Committee’s more literal translation of The Sadhana of Mahamudra,first published in 1990 as a study aid (changes available on our website). Jessie completed a first draft translation of a biography of Sakyong Mipham Rinpoche’s mother, Lady Könchok Paldrön, compiled by Lady Könchok’s husband, Lama Pejal. This will be edited by Emily Sell and published by Vajradhatu Publications. Jessie spent some time with Lady Könchok in Boulder before heading off to Tibet, visiting Surmang, Wenchen nunnery, and Kyere monastery—home to Karma Senge Rinpoche. Click here to see a slideshow of her trip. Jessie lived at the nunnery for several weeks, learning their dialect and enjoying their company. 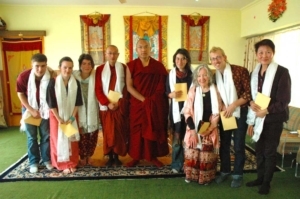 They were very appreciative of the Tibetan liturgical texts we published with Karma Senge Rinpoche last year, thanks also to Tony Duff’s TibetDoc word processor. The nuns often sang the chorus of the Vidyadhara’s Yeshe Tsogyal song Jessie had translated (click here for the latest translation), and this inspired her to set the English to that melody. 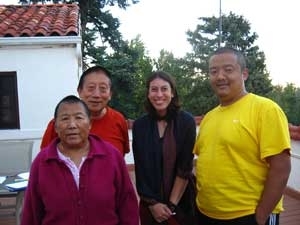 Jessie then traveled to India, attended the Kagyu Mönlam in Bodhgaya led by H.H. Karmapa. H.H. Karmapa with Jessie and other sangha members in Dharamsala. After that, she attended Mingyur Rinpoche’s Tergar Institute and became his “prepositional-adviser,” meaning when he was unsure of himself, he would look at her and she would say “angry with him, devotionto her, jealous of them.” She translated for his khenpo, Khenpo Kunga, for the daily meditation class. Larry was one of several faculty for a translation workshop in Bhutan, which ended up offering opportunities for a number of helpful and auspicious encounters, including a surprising request to lead the chanting of the Heart Sutra as we do in our centers, which was met with great enthusiasm. Read the full report. 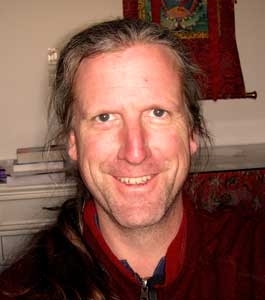 He taught a vajrayana weekthun at the Seattle Shambhala Center in the spring, a program for sadhakas in Halifax, and the Chakrasamvara training at Denma Ling this fall, along with Dorje Loppön Lodrö Dorje, Scott, Mark, and Walker. 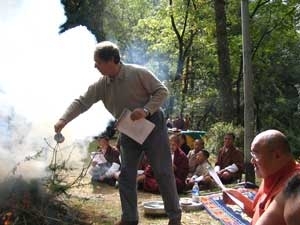 Mark continues to lead fire offerings at Dorje Denma Ling—both the full Four Karmas and shorter weekend ones, focusing on one karma. He will teach a Vajrayogini practice course in the fall in Halifax. Scott led a mahamudra reteat in the Pacific Northwest last winter and taught at Nitartha Institute in July. He also taught in the fall at a program by the Sakyong on meditation, as well as continuing his Tibetan class in Halifax. We are delighted to announce that Walker Blaine has now joined the Translation Committee in Halifax. A student at Naropa University (1984-86), he became hooked by the Vidyadhara at a fund-raising auction. He paid $50 for the Vidyadhara’s spontaneous definition of Naropa: “sick corpse person.” Years later Walker came to understand this as a Tibetan pun on the Sanskrit name. In Tibetan, na means “sick,” ro means “corpse,” and pa makes it a person. After spending most of the next fifteen years at Karmê Chöling and Shambhala Mountain Center, Walker has divided his time between retreat, studying Tibetan, and pilgrimage to sacred places under the instruction of Khenpo Tsultrim Gyamtso Rinpoche. This fall, Light of Berotsana hosted a weekend “Conference of Translators” in Boulder, Colorado. Many of our friends and colleagues were in attendance, and we had a very rich and meaningful schedule of presentations and dialogues. In the spring, we participated in the Khyentse Foundation translation conference entitled “Translating the Words of the Buddha,” taking place for a week in Bir, India. Larry and NTC-member Derek Kolleeny have been involved in the planning of this latter event, and we will report on both conferences in our next newsletter. Such gatherings seem long overdue, and with many people attending both conferences, we expect there will be a natural continuity of discussion.